Iran's efforts have been meeting mixed results in hot wars in Syria and Iraq and cold wars with Saudi Arabia and Israel. Nearly twelve months after Iran’s diplomatic victory with the JCPOA, Tehran is still embroiled in four different major regional conflicts, and a fifth may soon break out. Two of the current fights, led by its Islamic Revolutionary Guard Corps (IRGC), are “hot” ones: against opposition and Islamist groups in Syria and against ISIS in Iraq. The other two are “colder” ones: a regional feud with Saudi Arabia and efforts against Israel in southern Lebanon and the Golan Heights, which are increasingly shaped by the Syrian civil war. Also emerging is the concern about the new ISIS threat in Afghanistan. How is Iran doing on each front? The short answer: it is looking rough in the near term, but there may be light on the horizon. In Syria, Iran has expended much, but has relatively little to show in return. Growing numbers of the embedded IRGC officers guiding the Syrian and regional militia forces (and now even special forces from the Iranian regular army) are dying, most notoriously in the unrelenting fighting south of Aleppo around the town of Khan Touman, where sixteen IRGC soldiers were killed on May 6 and another twenty-two have been killed since. Each new push by the IRGC and its partners brings temporary success for Assad’s forces, only to be met by renewed resistance from the opposition and a return to grinding stalemate. Given setbacks for proregime forces, Iran and its allies are likely looking at an increasingly powerful and consolidated al-Qaeda and Jabhat al Nusra–led Islamist grouping dominating eastern Syria as ISIS’s hold fades. Russia will likely re-up its direct military intervention, but even with that help, Tehran will be forced to look at ever costlier investment to preserve Assad. The one benefit Iran has reaped from its sacrifices in Syria is a region-wide army of Shia and local militias stretching from Lebanon to Iraq and into South Asia, as well as increasing hybrid-warfare capabilities that can integrate drones and other conventional capacities into IRGC-led unconventional units. This force born out of adversity in Syria—with Lebanese Hezbollah as its most prominent component—will be a potent tool in asserting Iran’s influence throughout in the Middle East. Following the devastating 2006 conflict between Hezbollah and Israel, all sides have spent the last decade deterred from repeat escalation. Lebanese Hezbollah continues to be under unprecedented pressure fighting for President Assad in Syria, but it will emerge from this conflict with capabilities and experiences that will only make it stronger. In Iraq, Iran’s proxies and Shia militias are making progress against ISIS, but they cannot defeat the extremist group alone. In Syria, Iran’s army relies on Russian airpower. In Iraq, the militias must depend on more elite Iraqi Army units backed up by U.S. airpower to lead the anti-ISIS campaigns. This reality is embarrassing and frustrating for the groups’ leadership. Iran’s heavy hand in the current fight is stoking not only deeper fear and resentment among Iraqi Sunnis along the front lines in Fallujah and elsewhere, but it also exacerbating intra-Shia rivalries among those militias that are ideologically aligned with Iran, like Asa’ib Ahl al Haq, and those that are more nationalistic, such as the Popular Mobilization Forces and the Peace Companies guided by Iraqi Shia cleric Moqtada al Sadr. Tehran’s most frequent foreign-policy blind spot remains underestimating the degree to which its aggressive regional activities spur sectarian and ethnic backlash. If it can avoid triggering further Sunni radicalization, an internal Shia civil war, and the potential breakup of the country, however, the Islamic Republic is likely in good shape to continue its “Iranianization” of Iraqi security and political structures. Another huge question mark for the Iranian leadership is how far the tensions with Saudi Arabia and other Gulf Arab states will escalate. Even as both Riyadh and Tehran are looking to deescalate the conflict in Yemen, Bahrain’s revocation of citizenship for its most prominent Shia cleric has resulted in implied threats by the IRGC and other leaders to stir up insurrection among the island’s Shia majority. If that happens to a large enough scale, Saudi Arabia could intervene into Bahrain again like it did in 2011; though how Iran would respond is uncertain. This latest flashpoint follows a series of provocations in the past six months: Saudi’s execution of its leading Shia cleric, trade restrictions on Iranian shipping, barring Iranians from the Hajj pilgrimage to Mecca, the attack on the Saudi embassy in Tehran, Iranian weapons shipments uncovered heading into Bahrain and Kuwait, mutual cyber-attacks and their ongoing proxy war in Syria. So far, both sides appear to remain deterred from escalating into open warfare, however. The biggest uncertainty for Iran is predicting the new Saudi leadership’s behavior, as the young and ambitious Deputy Crown Prince Mohammad bin Salman attempts to solidify his position to succeed his father as the future king. The recent replacement of the Iranian Foreign Ministry’s combative Arab “handlers” with supposedly a more friendly set of diplomats is a likely signal that Tehran wants to keep its confrontation with Riyadh to a low boil. In Afghanistan, the emergence of Islamist State cells near Iran’s eastern border in the past year has alarmed Tehran. With the Taliban now fighting ISIS in those areas, the IRGC appears to be reviving its complicated ties to the Taliban as a hedge. Taliban leader Mullah Akhtar Mansour, notably, was killed last month by a US drone strike in Pakistan shortly after leaving Iran. How far Tehran will intervene in Afghanistan’s worsening security situation will ultimately be driven by threat perceptions, but anything on the scale of its role Iraq or Syria is very unlikely. The nuclear deal may have minimized the threat of a U.S. or Israeli attack on Iran, but Khamenei knows the coming year will stretch the IRGC’s regional military and security apparatus to new limits. The supreme leader will hope Iran can achieve a relatively stable position in Syria, help rollback ISIS in Iraq, contain intra-Shia conflict, keep pressure up on Israel, prevent the cold war with Saudi Arabia from significantly escalating, and contain the growing extremist threat in Afghanistan. This would help fulfil his goal to place Iran in a very strong, even dominant, position in the region. Victory on one or more fronts may be in reach, but will be a tall order. A sustained victory on all fronts will be all but impossible. J. Matthew McInnis is a resident fellow at the American Enterprise Institute. This article originally appeared at AEIdeas. 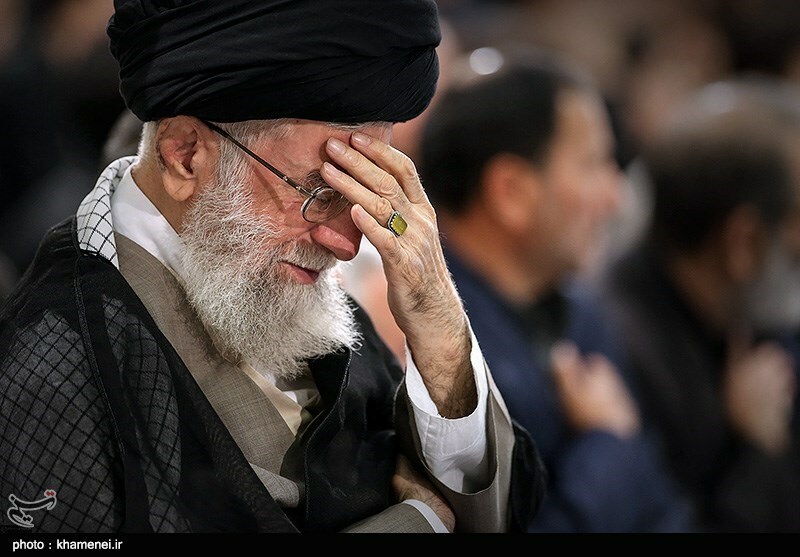 Image: Iran’s Supreme Leader Ali Khamenei at a ceremony during Ramadan. Photo via Tasnim News Agency/Khamenei.ir.